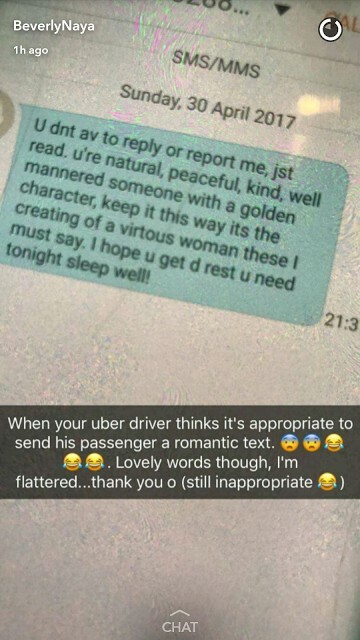 Beautiful,talented Nollywood Actress and Tinsel star, Beverly Naya, took to her Snapchat to share the message her Uber driver sent her after he dropped her off. The Actress also disclosed that she thinks the text is inappropriate. 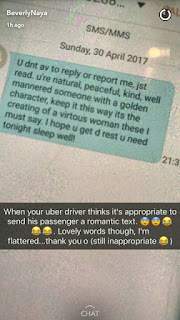 0 Response to "Nawa O,Checkout The SMS Uber Driver Sent Actress Beverly Naya"